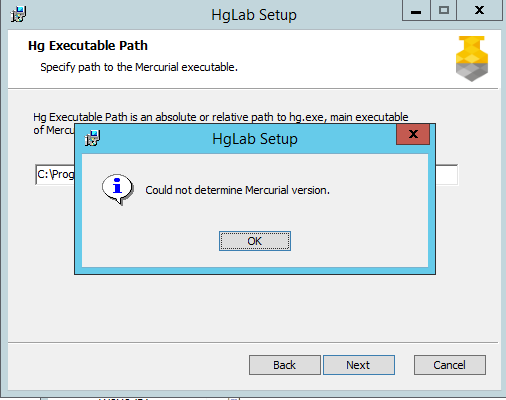 HGLab Mecurial update - Could not determine Mercurial version. My organization is having problems updating to the newest Mercurial version (1.10.6) from the previous version 1.9.7. We get the following error: Could not determine Mercurial Version. This is at the "Hg Executable Path" section in the installer. Was missing the Mercurial installation altogether in the newest update 1.10.6, as it wasn't a requirement in 1.9.7. After installation it went smoothly. Do you have Mercurial installed on the server? The install fails at the end and is reverting all of the install steps. The log points to mercurial as the issue when I look at it with my eyes. Could you please send the log in its entirety? Here's the log. Some things have been redacted. that there are no |, \ or / symbols in SQL Server login or password? Yes. I can confirm that there's no such characters in either login or password. Do you have any news regarding possible errors in the log or steps i can take to get updated with the newest HGLabs version? IIS) and start the install over? Or this is unacceptable in your situation?